Following devastating Jerusalem fire, fundraising campaign helps raise money for 23 homeless families as Passover approaches. 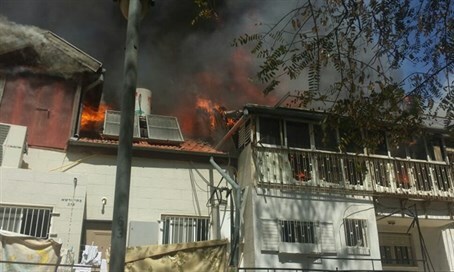 After a massive fire tore through their homes two weeks ago, 23 families in Jerusalem found themselves penniless, in the streets and searching for help. Their children — 83 in total — are homeless. Some were placed in temporary foster families, some were taken in by friends, but all they want is to reunite with their parents for the holiday. The families have now turned to the people of Israel to ask them not to remain indifferent and to help with their cause. City fund rabbis decided to take the families under their care and to do everything they can so that before Passover begins, the families will enter temporary homes, receive new clothes and dine properly until they are able to return to their renovated homes. The campaign goal is to allot each family $10,000 in order to help them with basic maintenance needs and holiday spending. Within the first few days of the campaign, thousands of dollars were already donated. To help donate to the cause, click here.